“Uncle Bob” Raben has been operating boats since he was 8 years old on Long Island in New York. 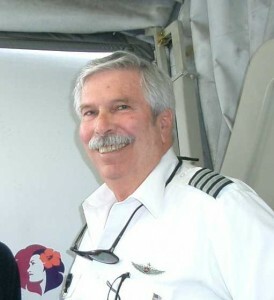 He is a US Coast Guard licensed Master, and recently retired as a Captain with Hawaiian Airlines after a career spanning over 35 years and more than 26,000 flight hours . In the late 1970’s and 80’s he was a Waikiki Beach catamaran captain, spending over 20 years sailing the Pacific off Diamond Head. In the evenings he sailed Sunset Dinner Cruise boats on the South Shore of Oahu, and later operated tour vessels on Kaneohe Bay. I’ve done all of the “Victory at Sea” sailing that I ever needed, and now it’s time to relax and just cruise…I’ve never seen a boat as “painless” as a Duffy…No blowing out the bilges, checking fluids, hanging out at fuel docks or gas stations with a 5 gallon tank in each hand…just turn the key, check the battery indications, unplug, untie and go! Bob is the Official Duffy Representative for Hawaii Kai and Oahu.